Giants pitcher Madison Bumgarner is Sunday's Player of the Day. Bumgarner struck out nine over six scoreless innings in the 3-2, 11-inning win over the Diamondbacks. Bumgarner did not earn a win-loss decision in the game because the Diamondbacks tied the score 2-2 in the eighth inning after he left the game with the lead in the sixth inning. Bumgarner rises to 13th place in Box-Toppers player rankings for the season. He earns 2.0 Box-Toppers points for being Player of the Day, giving him 14.7 for the season. Blue Jays pitcher Esmil Rogers is American League Player of the Day. Rogers pitched 7 2/3 scoreless innings in the 2-0 win over the Twins. Eric Hosmer of the Royals is AL Batter of the Day. Hosmer hit a three-run homer and went 3-for-4 in the 5-2 win over the Tigers. Nick Hundley of the Padres is National League Batter of the Day. Hundley hit a pinch-hit three-run double to beat the Rockies, 5-2. Reds pitcher Homer Bailey rises to 20th place. Bailey (7IP 9K ND in 3-2 win vs. Dodgers) earns 1.0 Box-Toppers point for being Player of the Game, giving him 13.0 for the season. Robinson Cano of the Yankees rises to 29th place. Cano (3-4 2RBI in 4-3 win vs. Red Sox) earns 1.0 Box-Toppers point for being Player of the Game, giving him 11.5 for the season. Phillies pitcher Cole Hamels rises to 38th place. Hamels (8IP 2H 9K W in 3-2 win vs. Braves) earns 1.0 Box-Toppers point for being Player of the Game, giving him 10.4 for the season. 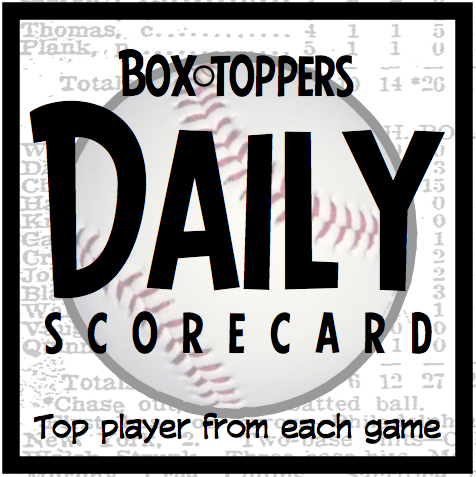 Bumgarner receives 2.0 Box-Toppers points for being Player of the Day. Rogers receives 1.7 for AL Player of the Day. Hosmer and Hundley each receive 1.5 for being top Batter of the Day in their league.